This Persistence Market Research (PMR) report analyzes the global isostearyl alcohol market and provides data for 2015 along with data for the forecast period 2016–2024. The main objective of the report is to identify market dynamics and provide recent updates and insights affecting various segments of the global isostearyl alcohol market. Isostearyl alcohol is a fatty alcohol or specialty alcohol that consists of 18 carbons in its molecular structure. It is also called isooctadecanol or isooctadecyl alcohol, and is derived from the reduction of isostearic acid. Isostearyl alcohol is used as an ingredient in personal care products and cosmetics owing to its viscosity boosting properties. Blends of isostearyl alcohol with other fatty alcohols are being widely used in personal care and cosmetics. The growing demand for isostearyl alcohol as an ingredient in personal care products as well as cosmetics (isostearyl alcohol is widely preferred as it prevents formation of crystals in personal care products) is expected to boost growth of the isostearyl alcohol market over the forecast period. To understand and assess market dynamics accurately, the report is categorically divided into three sections – by application, by end use, and by region. By application, the market is segmented into emollient, glossing agent, solvent, dispersing agent, pigment binder, and others (thickening and stabilizing agent). By end use, the isostearyl alcohol market is segmented into personal care and cosmetics. The report provides in-depth analysis of the global isostearyl alcohol market in terms of market volume and market value across five key regions. The report starts with a market overview of the global isostearyl alcohol market and provides a detailed analysis of the various market drivers, challenges, and trends. The report further focuses on market performance in terms of revenue share. The next few sections of the report analyze the global isostearyl alcohol market on the basis of application, end use, and regions; and present the forecast and market projections in terms of value for the period 2016–2024. The report evaluates the market on the basis of factors affecting the market; covering both the present scenario and future prospects. The report also focuses on the market in terms of absolute dollar opportunity, by application, and by end use for each of the five key regions; and carries out an impact analysis of the key drivers and restraints for each regional market. To deduce market volume size, captive consumption of isostearyl alcohol as well as traded isostearyl alcohol have been considered. To calculate market value size of captive consumption of isostearyl alcohol, the average production cost of isostearyl alcohol has been considered; while for calculating market revenue of traded isostearyl alcohol, merchant prices have been taken into consideration. The report considers various viewpoints based on secondary research. Furthermore, data points such as regional split and market split by application, by end use, and by region; and qualitative inputs from industry experts have been taken into consideration to arrive at suitable market estimates. The forecast presented in the report evaluates the actual and expected consumption of isostearyl alcohol in the global isostearyl alcohol market over the forecast period. For market data analysis, the report considers 2015 as the base year, with market numbers estimated for 2016. The global isostearyl alcohol market report profiles key industry players in order to evaluate their strategies and recent business developments. This section of the report includes a dashboard view of leading companies operating in the global isostearyl alcohol market. Croda International Plc., Oleon N.V (Avril Group), Jarchem Industries Inc., and Nissan Chemicals America Corporation are some of the top producers of isostearyl alcohol profiled in this report. Global sales of isostearyl alcohol was valued at US$ 107.8 Mn in 2015 and is projected to increase about 1.5X to be valued at US$ 164.7 Mn by the end of 2024. Global consumption of the isostearyl alcohol market was pegged at 14,700.0 tons in 2015 and is estimated to increase at a CAGR of 3.2% over the forecast period to reach 19,594.4 tons by the end of 2024. Isostearyl alcohol is a fatty alcohol or specialty alcohol that consists of 18 carbons in its molecular structure. It is also called isooctadecanol or isooctadecyl alcohol, and is derived from the reduction of isostearic acid. Mainly used in personal care and cosmetics, isostearyl alcohol is primarily used as an anti-aging agent in cosmetics. However, it also acts as a viscosity booster, emulsifier, and pigment binder. The global isostearyl alcohol market is driven by increasing demand for viscosity boosting and anti-aging agents. Isostearyl alcohol prevents formation of crystals in personal care products and hence its demand as an ingredient in personal care products as well as cosmetics is expected to boost growth of the isostearyl alcohol market over the forecast period. 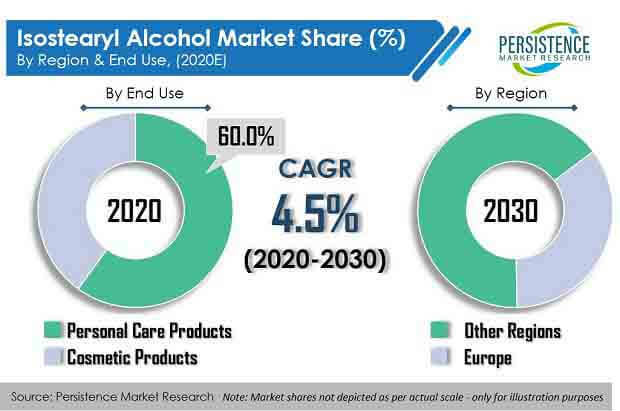 However, development of natural ingredients for anti-aging skin care products, rising demand for multifunctional personal care ingredients, and availability of alternatives to isostearyl alcohol are some of the major challenges for the isostearyl alcohol market. A recent trend observed in the global isostearyl alcohol market is the blending of isostearyl alcohol with other fatty alcohols to improve its properties. Due to the monotonic properties of isostearyl alcohol, producers are focusing on developing various blends with other fatty alcohols as part of their product strategy. The global isostearyl alcohol market can be segmented on the basis of application, end use, and region. On the basis of application, the global isostearyl alcohol market has been segmented into emollient, glossing agent, solvent, dispersing agent, pigment binder, and others (thickening and stabilizing agent). In terms of value, the emollient segment is estimated to be the fastest growing segment over the forecast period. On the basis of end use, the global isostearyl alcohol market has been segmented into personal care and cosmetics. Personal care is currently the most prominent segment in this market in terms of volume. The personal care segment was valued at US$ 63.9 Mn in 2015 and is estimated to account for 59.2% share in the global isostearic alcohol market by the end of 2016 – likely to exhibit a CAGR of 4.4% over the forecast period. The cosmetics segment was valued at US$ 43.9 Mn in 2015 and is estimated to account for 40.8% share in the global isostearic alcohol market by the end of 2016 – likely to exhibit a CAGR of 5.4% over the forecast period. The cosmetics segment is expected to gain traction over the forecast period due to a rising demand for anti-aging products. The emollient and solvent segments collectively accounted for 49.5% share of global consumption of isostearyl alcohol in 2015 and are expected to exhibit CAGRs of 3.9% and 3.5% respectively over the forecast period. The glossing agent and dispersing agent segments collectively accounted for 28.0% share of global consumption of isostearic alcohol in 2015 and are expected to exhibit CAGRs of 4.4% and 3.9% respectively over the forecast period. On the basis of region, the global isostearyl alcohol market is segmented into Asia Pacific, Europe, North America, Latin America, and Middle East & Africa. In terms of value, the Europe and North America geographies dominate the global isostearyl alcohol market. 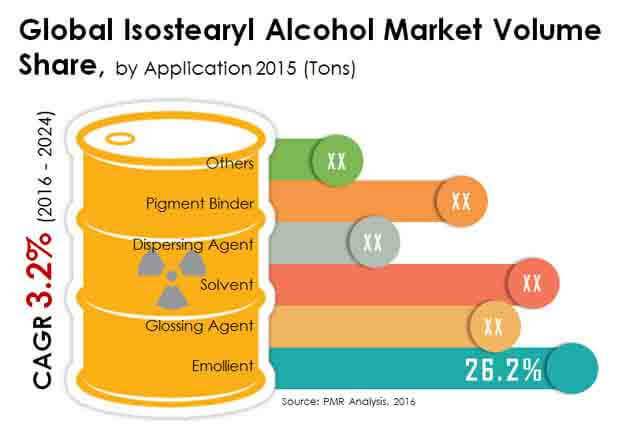 Europe was the largest market for isostearyl alcohol in 2015, accounting for over one-third share of the overall global isostearyl alcohol market and is expected to be an attractive market for isostearyl alcohol over the forecast period. However, the Asia Pacific market is projected to emerge as the fastest growing market during the forecast period.